Time is always ticking no matter you care it or you don’t care it, everyone knows it including myself, to remind myself don’t waste too much time on gaming, reading news or something else, I developed a little tool which I call it “Personal Schedule Management Tool” to achieve this simple goal. Shows Windows Balloon Tips with the task as content, screenshot below. Invokes managed Microsoft Speech API: SpeechSynthesizer.Speak() to remind me even if I am not in front of my dev-box at that time. The tool is a WinForm developed in C#, it has no Windows and starts in system tray, to achieve this I set MainWindow’s FormBorderStyle = None, ShowIcon = False and ShowInTaskBar = False, see below. 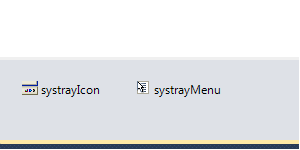 One more thing is drag two controls onto the form: System.Windows.Forms.NotifyIcon, System.Windows.Forms.ContextMenuStrip and and naming the instances as “systrayIcon” and “systrayMenu”.